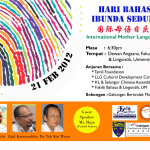 Approximately 200 people from various ethnic background attended the International Mother Language Day 2012 celebration on 21 Feb 2012, 630pm-930pm at Dewan Kuliah Angsana, Faculty of Languages and Linguistics, Universiti Malaya. The people had adopted resolutions as follows. 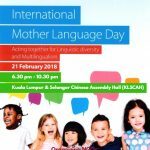 This program was jointly organized by Tamil foundation, LLG Cultural Development Centre, KL & Selangor Chinese Assembly Hall and Faculty of Languages and Linguistics Universiti Malaya. 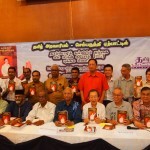 It was supported by Gabungan Bertindak Malaysia (Plan of Action Malaysia Coalition) which comprised of 21 NGOs from various background aimed at formulating ideas and ways to tackle social issues beyond racial lines. 1. To formulate policies that recognize, promote, protect and realize multiculturalism and multilingualism as inherent strengths of all communities in Malaysia and dismantle policies that are threat to cultures or languages of Malaysians. 3. To ensure all high quality movies, writings, performances and art products produced in Malaysia are equally eligible for the status of national movies/literature/performances/ arts and hence entitled to enjoy the state’s cultural resources, regardless of the language and ethnic background of those productions. 6. To ensure the unrestricted development of all schools-national, mother tongue and religious- by equitably allocating resources to them, as well as recognizing non-formal education based on the oral traditions of indigenous peoples.